A couple of months ago I wrote about the two large Douglas firs belonging to MNTHD (my neighbor two houses down), and the possibility that I would end up in bed with one of them some dark and blustery night. I hate it when I’m proven semi-prophetic. I didn’t hear the crash, which I understand came about 4:30 AM. When I woke up at 7:30, given the high-wind-warning situation, the first thing I did was look out my bedroom window. I only saw one tree. Now, this isn’t entirely unexpected, given my eyesight. So I put on my glasses. I still only saw one tree standing. So I threw some clothes on and ran out the front door. Only one came down. And it didn’t come near my house (thank goodness). It hit the house of MNTHD. It smooshed his roof a bit and tore off his gutters. The top 30′ or so broke off and hit the corner of the garage of the next house beyond MNTHD and also did some slight damage to their van. 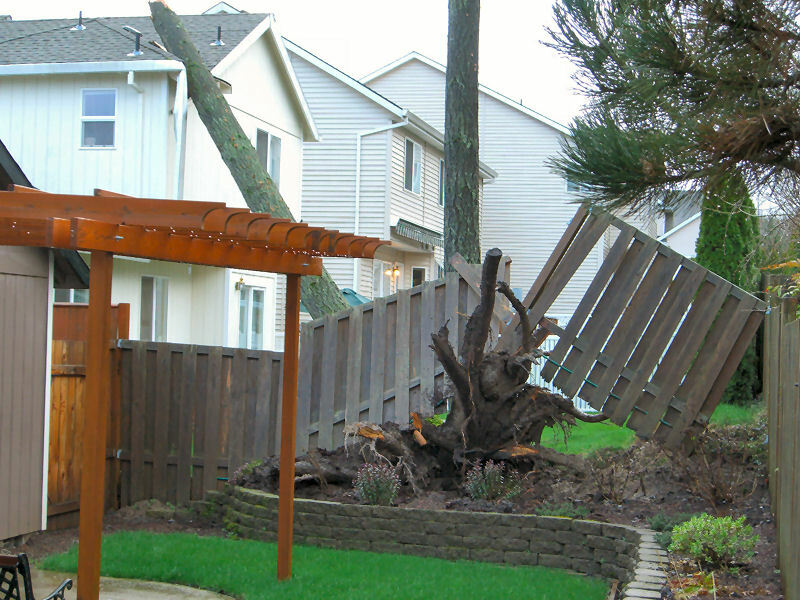 You can see from the pic that my direct neighbor’s fence was pretty well destroyed when the root ball pulled up. If you read my earlier entry, you will know that “having a guy look at it” was what he has been promising to do for the last 6 or 8 years while these two trees slowly died. I hope the “guy who looks at it” explains to him that the remaining tree will probably not be standing for long and needs to be removed. I hope the wind isn’t as bad as predicted!